Is There a River In Thailand that Emits Fireballs? There is a river in Thailand that emits fireballs, referred to as Naga’s Fireballs. The phenomenon takes place in the Nong Khai province along the Mekong River has occurred each year for hundreds of years. On the 11th lunar month, coinciding with the end of the Buddhist Lent, pink, red and orange fireballs jump from the river into the sky for about three days, and the occasion is celebrated with a festival. 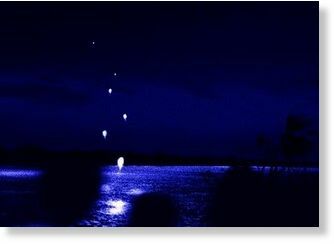 Legend states that the fireballs are caused by a mythical serpent creature from the river, but scientists believe they could be the result of heated gas being released from decomposed plants and animals on the bottom of the river. The Mekong River runs for 2,610 miles (4,200 km) in Southeast Asia, from China to Vietnam. Fish from this river are estimated to provide the main source of protein for nearly 50 million people in Southeast Asia. The Mekong River Commission has stated that building hydroelectric dams in the river would provide as much as 8% of the area’s energy needs by 2025, but critics argue that dams could cut the fish supply by as much as half. Vermont Stories and Historical Gossip BEFORE GLOBAL WARMING. 1.Those people whose families have lived in Vermont since it was settled and whose family folklore includes tales of the great Republic of Vermont, when Vermont was an Independent Country, and who have never quite forgiven Ethan Allen for agreeing to join the Union despite all of his other fine accomplishments. These people, who will subsequently be referred to as "Native Vermonters", are hardy and hard working, straightforward and straight talking, and are the foundation of everything that makes Vermont great. They are also almost, but not quite, completely invisible in the current Vermont landscape. 2.Everyone else, who will subsequently be referred to as "Flatlanders." Flatlanders are sometimes called "New Yorkers" by older Native Vermonters. Vermont has always had a population of Flatlanders: those who've moved to Vermont from somewhere else because Vermont "is such a nice place." In recent years those who pay attention to the media might conclude that Flatlanders have taken over the entire State. It is true that important Towns like Montpelier (the State capital) and Burlington (a self-styled major metropolitan city) are almost, but not quite, exclusively populated by Flatlanders. Native Vermonters quite sensibly regard the current large numbers of Flatlanders to be a temporary phenomenon and have the attitude of "This Too Shall Pass." Like mud season. They know that as soon as it appears to the Flatlanders that Vermont has somehow, despite all their progressive efforts , become "just like everywhere else", they will move away in droves. Perhaps leaving behind a few people, who might after a few generations be considered "Newcomers" to Vermont by the Natives and occupy that wide gray area between the two solitudes, so to speak. This book reveals for the first time the true History of Vermont as maintained by Native Vermonters. When the influx of Flatlanders started to become chronic Native Vermonters agreed in a series of Town Meetings to conceal some of the more interesting episodes of Vermont History by the simple and expedient method of denying knowledge of any such thing and implying that the questioner was a few cows short of a herd. This tactic was incredibly successful and centuries of Vermont History were hidden this way. The truth of this remarkable assertion can be demonstrated at any time by finding an older person in Vermont (Flatlanders without exception move to Florida once their joints reach a certain age and temperature) and asking that person whether he or she has heard of the events described in this book. The answer will invariably be "No." followed by something on the order of "What's the weather like on the planet you come from?" 2.He built and occupied a one-room log cabin with just a wood stove and without utility power for an entire Vermont winter (11.5 months). Actually he did this for two entire Vermont winters in a row but no one noticed because it's extremely difficult for anyone, even Native Vermonters, to determine when one Vermont winter ends and the next one begins. One day after walking uphill (of course ) in the snow for hours into Town for a breakfast of pancakes and maple syrup the other people in the Town Restaurant began to talk about strange events in his presence. After several more days of walking uphill (of course ) in the snow for hours into Town for a breakfast of pancakes and maple syrup the author began to piece together the incredible Secret History of Vermont. Why is the author willing to reveal these incredible truths? The answer is that if he publishes a book and someone actually buys it then all those breakfasts become tax-deductible as a research expense. Free food! Everyone has their price when it comes to betraying deep secrets. That's mine. The word "Vermont" derives from Olde Neanderthale but modern day scholars are divided as to its precise meaning. Some say that it comes from "ver mont" which in Olde Neanderthale means "Heaven on Earth" but others insist that it really comes from "verm ont" which means "Any place that if you stay there during the winter you must have rocks in your head." Olde Neanderthale is a very pithy language. Back in the days when the U.S. Federal Government was disorganized and inefficient (1789 to date) it often had difficulty maintaining an adequate supply of currency. The problem with cows is that they are large and difficult to store. The problem of keeping the paddlewheel boats running during the winter was solved in a typical Vermont fashion. Instead of trying to keep the water channels open, the paddlewheels were affixed with chains, the entire boat was mounted on sled runners, and a snowplow was attached to the front. As a result, the paddlewheel boats ran considerably faster on the ice during the winter than they did in the water during the summer. The summer slowdown was tolerated because it typically only lasted 15 days. Vermont is unique among the states in that it has two completely independent State governments. The first, known as the Vermont State Government, has no bureaucrats, has levied no taxes, and is of the opinion that it isn't the government's place to go around telling people what to do. It has the highest approval ratings of any governmental organization in the observed universe. The other is known as the Montpelier Legislature whose motto is, "Pass six unenforceable regulations before breakfast." Because it is a major cause of pain and suffering the Montpelier Legislature occasionally proposes a bill outlawing Death and is puzzled each time when the idea is solidly rejected by the citizens. This is because the citizens have seen that Death is practically the only way a member of the Montpelier Legislature can be persuaded to give up his or her seat. During the right time of year a visitor to Vermont cannot help but to be astonished at the amount of acreage devoted to growing corn. A simple calculation shows that during its 15 day growing season Vermont grows enough corn to feed all of Asia and Africa for several years. Where does all this corn go? Some of it is fed to cows. Cows are no longer legal tender but cows give milk that can be made into Ben and Jerry's Ice Cream which is legal tender in most parts of the world. Some of the corn is converted into whisky most of which is discretely exported to foreign places like Kentucky and Tennessee. Unlike moose, which are officially everywhere, mountain lions officially don't exist. There hasn't been a proved sighting of a mountain lion by a certified official for over a hundred years. Occasionally someone will claim they've seen a mountain lion, or catamount as they're sometimes called by Native Vermonters, but the evidence is never enough to survive the so-called trial by immersion in a Montpelier manure pit. The absence of the usual clue, warmer weather, makes it difficult to tell when spring is coming to Vermont. Nevertheless there are a few signs well known to all Vermonters. When people all over the State are awakened half an hour before the alarm clock by the vigorous percussion of a diamond-hard beak on chimney pipe or roof flashing then you can tell that the springtime mating season of the Vermont Tin Pecker has begun. It's not that Vermont isn't full of jokers. (Drive a car with out-of-state plates and ask directions from someone in Vermont sometime. Please!) It's just that the conclusion that every single Vermont archaeology student independently decides to pull exactly the same prank is one that only an Archaeology Professor or Radiocarbon Lab Owner would come to. Vermont humor is pretty damned dry, isn't it? YEP. This place is probably where the term "deadpan" came from. This pendulum provides visual proof of the Earth's rotation. Designed by Jean Leon Foucault in 1851, it is called the Foucault (foo-koh) Pendulum. Pendulum: a body suspended from a fixed point so as to swing freely to and fro under the action of gravity. I don't know about you but this stuff fascinates me. Doomstead Diner INFECTED! Avoid Until Further Advised! I am in the process of eliminating ALL links to the Doomstead Diner. It is infected with a HIGH RISK type Trojan virus. Cat Videos are good or you. REALLY! Finally, science confirms what we all already knew in our hearts—videos of cats unrolling (and then re-rolling) toilet paper are good for our brain health! In fact, anything that makes us laugh is good for our brains. According to new research from Loma Linda University in Southern California, a big fit of laughter (you know, the kind where you think you might pee your pants?) gives your brain a great workout. And that’s not all. The participants who watched the funny video also scored higher on memory tests than those who didn’t watch it, and they also had a significant decrease in cortisol, a stress hormone that can lead to high blood pressure, heart disease, and diabetes. And on that note, have you seen the video of the cat in a shark costume on a Roomba? (at link) (You’re welcome!). km/h) through metal, compared with about 761 mph (1,224 km/h) through air. In the past month, we have responded to over 900 calls for service, and we had 422 contacts through motor vehicle stops. We arrested 17 people for a variety of crimes, including DUI, domestic assault, reckless endangerment, unlawful restraint, and more. The busiest days of the week for calls for service were Wednesday, Thursday, and Friday. The most common reasons for calls this month were suspicious circumstances , public or medical assists , motor vehicle crashes, and motor vehicle complaints. Our marine unit is back on the water. As the weather warms, we expect activity on the lake to pick up significantly. **** Aggression Defense class #2 of 2014 , Drug Take Back Day, child safety seat inspections, special traffic details, and more. For further information or to comment, please call Linda Kingston at 264-5509. Now these look like homey homes for happy homebodies!